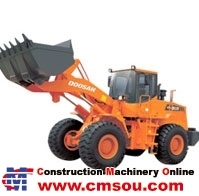 From the beginning, Doosan has had great concern for machine operators. People need to work in a well-designed and comfortable environment. The work area is spacious, with several places for storage. The checking and monitoring devices are comprehensive. There is an open view of the work area. For night work, operators are provided with powerful front and rear lighting.